It’s on my calendar. An annual appointment that I look forward to each year. Squashed in between Christmas parties, shopping, church pageant practice & violin recitals is Salvation Army bell ringing with my mother. When I was first asked if I would don a red apron and stand by the kettle at the local grocery store in the freezing cold for a couple of hours, I said, “yes.” Not because I had felt a special call to this position, but because I was asked and I didn’t have a good excuse not to. Was I looking forward to it? Probably not, but it was only for a couple of hours and I would be visiting with my mom. It didn’t seem like a big sacrifice so I agreed. I have done it ever since. What started out as an obligation has turned into an incredible blessing. Spending time with my mom is always a good thing, but seeing the community through the eyes of a bell ringer has been life changing. I am utterly amazed at how generous this community is. I expected some people to drop a couple of spare coins that were in the bottom of their coat pocket into the kettle, but I had not expected how intentional people are with their giving. People in a hurry to rush into the store for milk, bread or toilet paper, stop and take the time to open their purses, open their wallets and get some bills to fold and place in the slot of the kettle. They stop. They pause. They give. On the way out of the store, with their arms full of packages, I’ve seen them set down their bags, take off their gloves, struggle with getting their wallets out of their back pockets and give. Not just the spare change, but the money that they have earned and placed in their wallets for a purpose. I’m sure they aren’t expecting to give when they leave home in the morning, but when they see the kettle and hear the bells, they donate. They feel called to help the Salvation Army and hence, help their community. This year I have been asked to be the area coordinator for the Red Kettle Drive. I am honored to hold this position as I ask people about donating a couple of hours of their hectic holiday season to ring the bell. If they’ve done it in the past, they are quick to agree to help again. Obviously, their experience matches mine. They have found that two hours of bell ringing has lifted their spirits and taken the focus off of the hustle and bustle of shopping and into the true spirit of the season, the season of giving. First off, the money that you place in that kettle remains in the community that it is in. Isn’t that amazing? Our area includes 5 different small zip codes, but it’s good to know that your neighbors will be benefitting from your donation. Currently this area has been receiving about 5 calls a week for help. Did you know your neighbors needed you this much? Approximately 87% of your donation goes to the actual person in need. The Salvation Army has been around since 1865 and in the United States since 1886. Talk about an established charity! Your donation helps feed the hungry, house the homeless and help the addicted plus a lot more. 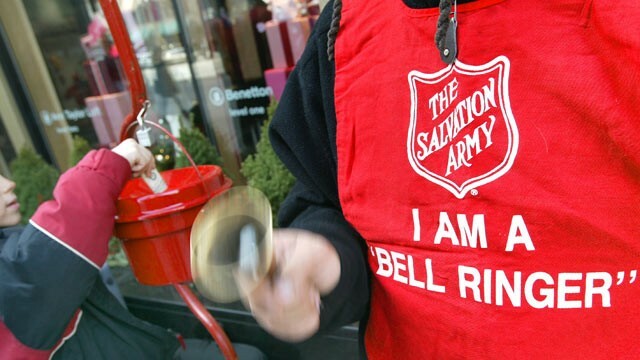 It is hoped that an hour of bell ringing will provide a homeless person with one night of lodging and 3 meals. The Salvation Army is actually a church that is serving people that aren’t sitting in pews. They believe they are called to roll up their sleeves and get to work to meet the material and emotional needs of a person before they can minister to their spiritual needs. When you are giving, please recognize what a difference you are making. It’s not just your spare change, it’s your giving spirit that will help others. Your spare change or your carefully considered donation combined with the same from others can give a member of your community hope. God Bless You for giving.